Businesses have difficulty raising capital - that's no secret. This difficulty (among other reasons) has caused many to look at leasing as an alternative financing arrangement for acquiring the use of assets. All types of equipment leasing-from motor vehicles to computers, from manufacturing machinery to office furniture-have become more and more attractive. 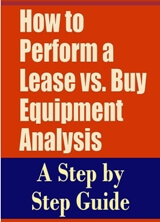 This guide describes various aspects of the lease/buy decision. It lists advantages and disadvantages of leasing and provides a format for comparing costs of the options. A lease is a long term agreement to rent equipment, land, buildings, or any other asset. In return for most-but not all-of the benefits of ownership, the user (lessee) makes periodic payments to the owner of the asset (lessor). The lease payment covers the original cost of the equipment or other asset and provides the lessor a profit. The operating lease, or "maintenance lease," can usual­ly be canceled under conditions spelled out in the lease agreement. Maintenance of the asset is usually the responsibility of the owner (lessor). Computer equip­ment is often leased under this kind of lease. You may also hear leases described as net leases or Kross leases. Under a net lease the lessee is responsible for expenses such as those for maintenance, taxes, and insurance. The lessor pays these expenses under a gross lease. Financial leases are usually net leases. In addition to financial organizations, there are com­panies which specialize in leasing. Some are engaged in general leasing, dealing with just about any kind of equipment. Others specialize in particular equipment, such as trucks or computers, for example. Provides protections against the risk of equipment ob­solescence, since the lessee can get rid of the equipment at the end of the lease. There may also tax benefits in leasing. Lease payments are deductible as operating expenses if the ar­rangement is a true lease. Ownership, however, usually has greater tax advantages through depreciation. Naturally, you need to have enough income and resulting tax liability to take advantage of those two benefits. Further, you must never forget that a lease is a long-term legal obligation. Usually you can't cancel a lease agreement. So, it you were to end an operation that us­ed leased equipment, you might find you'd still have to pay as much as if you had used the equipment for the full term of the lease. Historically, financial leases were "off the balance sheet” financing. That is, lease obligations often were not recorded directly on the balance sheet, but listed in footnotes, instead. Not explicitly accounting for leases frequently resulted in a failure to state operational assets and liabilities fairly. In 1977 the Financial Accounting Standards Board (FASB), the rule-making body of the accounting profes­sion, required that capital leases be recorded on the balance sheet as both an asset and a liability. This was in recognition of the long-term nature of a lease obligation.